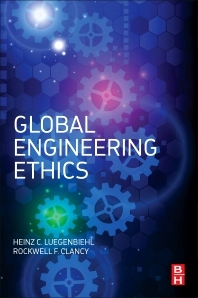 Global Engineering Ethics introduces the fundamentals of ethics in a context specific to engineering without privileging any one national or cultural conception of ethics. Numerous case studies from around the world help the reader to see clearly the relevance of design, safety, and professionalism to engineers. Engineering increasingly takes place in global contexts, with industrial and research teams operating across national and cultural borders. This adds a layer of complexity to already challenging ethical issues. This book is essential reading for anyone wanting to understand or communicate the ethics of engineering, including students, academics, and researchers, and is indispensable for those involved in international and cross-cultural environments. Heinz C. Luegenbiehl is Professor Emeritus of Philosophy and Technology Studies at Rose-Hulman Institute of Technology, Terre Haute, Indiana, where he taught for thirty-four years. During that time he also taught at the U.S. Air Force Academy, Nanzan University and Kanazawa Institute of Technology, both in Japan, and National Yunlin University of Science and Technology in Taiwan. After retiring he taught for two years at the University of Michigan-Shanghai Jiao Tong University Joint Institute in Shanghai. He received his Ph.D. from Purdue University in philosophy and has held numerous fellowships, including Fulbrights, NASA, NEH, NSF, and the German Academic Exchange Service. His publications are primarily on engineering ethics, but also on liberal education and the social dimensions of technology. Rockwell F. Clancy is a lecturer in engineering ethics and philosophy, at the University of Michigan-Shanghai Jiao Tong University Joint Institute, research fellow in the Institute of Social Cognitive and Behavioral Science, Shanghai Jiao Tong University, and Associate Editor of the Asian Journal of Law and Society. He has served as a long-term educational consultant at Purdue University, having previously taught in the US and Europe. His current research and teaching interests are largely interdisciplinary, covering engineering ethics, philosophy of technology, moral psychology, European philosophy, philosophy of religion, political philosophy, and cross-cultural communication. Dr. Clancy holds degrees from Purdue University (PhD), the Katholieke Universiteit, Leuven (MA), and Fordham University (BA).